One of the most important aspects of any software enterprise is the help that comes post-software acquisition – of course we are not diminishing the equally important service pre-acquisition! At Transoft Solutions, we have always prided ourselves not only on the quality of the software we produce, but the technical and sales teams that stand behind it. So who are the people behind tech support at Transoft and what do they do? Tech support consists of highly qualified individuals located at our Richmond, BC headquarters, and our European office in Rotterdam, Netherlands. A technical support group is also in place for our aviation products in Gothenburg, Sweden. Through this setup, we are able to provide support on a nearly 24/7 basis. New staff are well-trained by Product Managers (PMs) and more experienced technical support at Transoft, some of whom have been working with the software from its very beginnings 26 years ago. Considering our large customer base – Transoft’s products are used by over 30,000 users in over 130 countries – our technical support team is small but nimble. This is a testimony to the high level of quality control (QC) that goes into each of our software offerings. A key part of what distinguishes Transoft’s tech support from competitors is the company’s personal touch. Transoft’s CEO has, since inception, mandated that all incoming calls, emails and technical issue “tickets” are managed by individuals, not routed through voice-activated prompts. 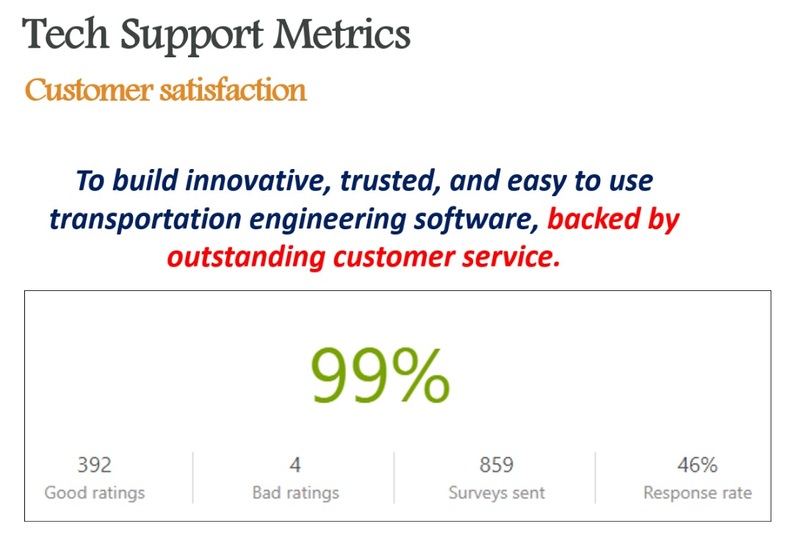 Ultimately, success from a technical support standpoint is measured in customer satisfaction. A recent survey that incorporated data from Transoft’s built-in software to monitor tech support showed 99% of respondents gave Transoft a good rating. The 2017 poll surveyed Transoft customers in the Europe, Middle East and Africa (EMEA) region. (see graphic below). U.S. client Chris Fitzcharles, who is on the applications operations team at HNTB, an AEC firm, was tasked with setting up AutoTURN on a new server. He immediately called Bozana to solicit her help in moving the software over. Over the past couple of years Chris has developed such a good relationship with the tech support team, that he won’t hesitate to ask for help in maintaining or upgrading the HNTB system. According to Transoft President and CEO Milton Carrasco, having a solid, reliable and extremely knowledgeable technical support team in place is an integral part of the complete software package that Transoft provides.